Vanhove Barbara born in Watermael-Boitsfort, Belgium, on 12 February 1974. She grew up with artistic aspirations. At a young age, she enrolled in painting and drawing classes that formed the foundation for her career as an artist. 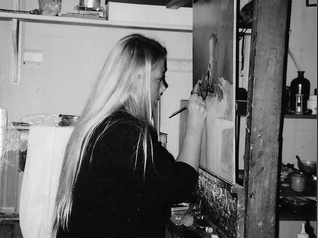 She graduated from the Bischoffsheim Institute in Belgium, before spending several years as a set painter in the theatre as well as working on large murals for the Théâtre de la Monnaie in Belgian capital. Barbara's big break came when she was offered a place in the workshop of the enigmatic Willem Dolphyn. 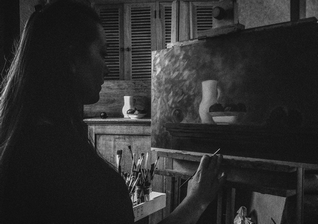 Over the past 4 years her development under his guidance has been significant, and Barbara has quickly acquired the techniques of the old masters and has found stimulation and inspiration in Willem's studio. Barbara's still lifes are inspired by the great masters of Dutch and Flemish 17th century. 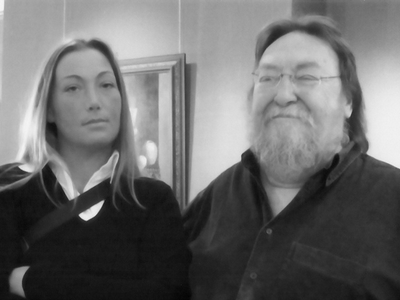 Her work tends toward realism idealized through noble subjects. Specialized in painting "Still Lives" using the wet on wet technique dating back to the days of the painter Jan Van Eyck. She usually painted on semi-absorbants wood panels. The Panel or canvas are prepared carefully and are fitted with a primer. The base is slightly colored to get a warm ochre tone in light gray which will form the basis for drawing. 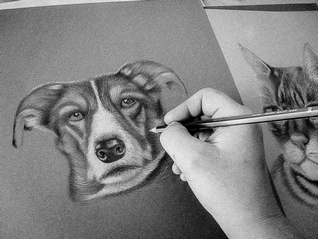 Then, the subject is drawn with precision to the pencil. Then applied a thin layer of liquid paint. In this step, she already has the design, colors and shadows. Then the oily paint can be applied in several layers with different mediums and oils. She works mainly with natural light from the North. Barbara's compositions are developed with the emotion, contemplating the soul of objects, the play of light, shadows and reflections. From her works, a peaceful and balanced universe emerges which allows escaping from an ever more stressful daily. Her work has been shown in exhibitions in Belgium, London and international fairs. She currently lives and works in Belgium. "Willem is also expecting much from his youngest pupil, Barbara Vanhove, who considers as the newcomer for the future." Willem Dolphyn. De virtuoos van het stilleven. The virtuoso of still life. Le virtuose de la nature morte. Venlo, 2004 (p. 31), Van Spijk Art Projects.